I am often told how adventurous, crazy or “brave” I am, and that I take big risks. I don’t take crazy risks, but I do take calculated ones, and participate in activities that may seem overly risky, but I make sure all precautions are taken. More people are killed in car accidents than in “adventure sports” accidents. I love nature, I love diving, but I am not reckless, far from it. My husband, Randy, and I took our young adult children, Wes and Ally, on our family dream trip to Guadalupe Island to cage dive with Great White Sharks, and we could not wait to get on the boat and into the water. Before you begin to think I am the world’s most irresponsible mom, you should know that Great White Sharks do not “prey” on humans. Seriously! Of the 33 or so Great White bites a year, most of them are “sample” bites, most are not fatal. We are the ones killing them in unsustainable numbers. Many divers are animal enthusiasts, and conservationists, and the idea of being in close proximity to these amazing and beautiful apex predators is downright exhilarating. When the shark hit, the young man who was in the middle pulled me back…and believe me, I was grateful! The shark was panicked and thrashing violently…it felt like being in a big washing machine. I kept trying to hold on to the bottom of the cage, but just could not keep my grip, so I floated up toward the shark. The shark actually did a 360 degree turn in the opening, which caused his gills to bleed. My husband and daughter, watching from above, thought it was my blood, so you can imagine how upset they were, but my daughter who was taking photos kept shooting and caught the entire event from above. After what seemed like an eon the shark managed to free himself and took off, scared to death. While the shark was upside down I received a bump on the head from his snout, and he somehow ended up with my air hose in his mouth, so my air was wet and salty. What an experience! I wouldn’t want to go through it again, but my grandchildren will think I am totally cool, when I have them. Talk about being up close and personal with a Great White! You know, I guess I could tell a harrowing tale of a Great White Shark “attack”, but it just would not be true. No shark showed any aggression whatsoever while we were there. Hey, getting in a cage with Great White Sharks swimming around has inherent risk, but no shark at Guadalupe has attacked a human being, and I know people who have been with them outside of the cages, free diving. Would I go cage diving again? Yes, it was a breathtaking experience. I wasn’t hurt, no harm done (except to the poor shark’s gills) and I take full responsibility for being in the cage. I do plan to go again, absolutely. Lightning doesn’t strike twice, right? Editorial note. Shark cage diving is a controversial subject. Some people are hostile to the idea, feeling that it affects the sharks’ long term behaviour. But scientific research1 shows that if run properly, cage diving doesn’t affect the behaviour of the sharks. And when compared to the damage done by shark culls and legal and illegal fishing, shark cage diving seems positively beneficial by bringing in income and giving local people a reason to welcome the presence of sharks. 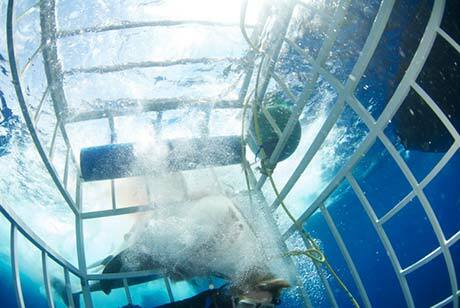 What do you think – would you go cage diving with white sharks? Let us know.